I love finding creative ways to introduce math concepts to my preschooler. 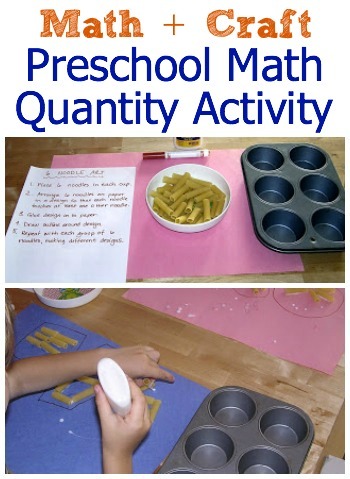 This preschool math activity was a big hit. He is so drawn to numbers and loves to count and so I can use that to “lure” him into doing crafts, which is not always his first choice activity. Win-win! The lesson behind this preschool math activity is to learn that shape does not determine quantity. In this case, kids discover 6 different ways of arranging 6 noodles. I added the sorting into muffin tins (I wanted Kiddo to sort with chopsticks, but I couldn’t find them.) and the printed instructions (I love that I can use written instructions! — ignore my grammatical error in the photo… I was too lazy to write it again). 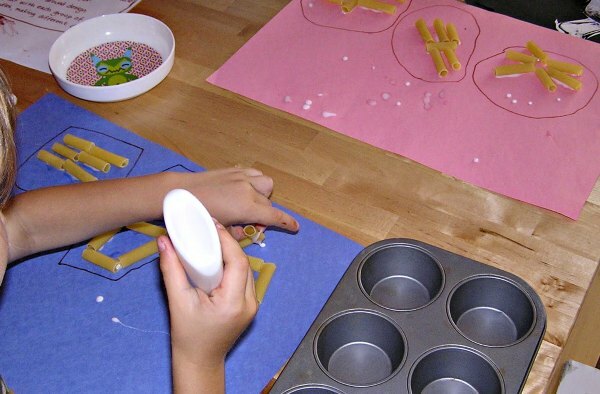 Arrange 6 noodles on paper in a design so that each noodle touches at least one other noodle. Repeat with each group of 6 noodles, making different designs. 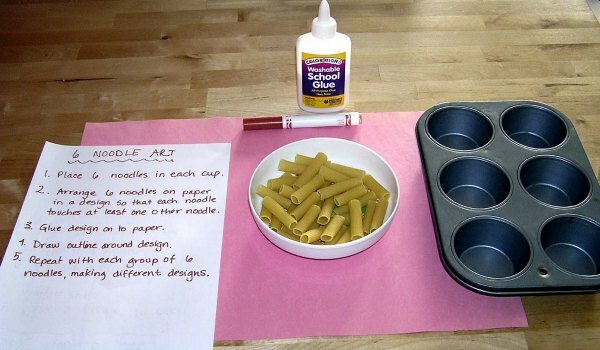 I think a great extension of this activity would be to choose a shape such as a triangle or rectangle and challenge your child to make as many different ones as they can, but with the same number of noodles. More than 6 noodles would be required though — maybe 10 or 12? Of course you could do this with materials other than noodles: flat marbles would be great, toothpicks, straws… you name it. I adapted this activity from the book Games for Math (affiliate link).